Our foremost literary critic celebrates the American pantheon of great writers from Emerson and Whitman to Hurston and Ellison, to Ursula K. LeGuin, Philip Roth, and Thomas Pynchon. Harold Bloom is our greatest living student of literature, "a colossus among critics" (The New York Times) and a "master entertainer" (Newsweek). Over the course of a remarkable career spanning more than half a century, in such best-selling books as The Western Canon and Shakespeare: The Invention of the Human, he transformed the way we look at the masterworks of western literature. Now, in the first collection devoted to his illuminating writings specifically on American literature, Bloom reflects on the surprising ways American writers have influenced each other across more than two centuries. 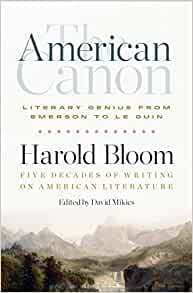 The American Canon gathers five decades of Bloom's essays, occasional pieces, and introductions as well as excerpts from several of his books, weaving them together into an unrivalled tour of the great American bookshelf. Always a champion of aesthetic power, Bloom tells the story of our national literature in terms of artistic struggle against powerful predecessors and the American thirst for selfhood. All of the visionary American writers who have long preoccupied Bloom--Emerson and Whitman, Hawthorne and Melville, and Dickinson, Faulkner, Crane, Frost, Stevens, and Bishop--are here, along with Hemingway, James, O'Connor, Ellison, Hurston, LeGuin, Ashbery and many others. Bloom's enthusiasm for these American geniuses is contagious, and he reminds us how these writers have shaped our sense of who we are, and how they can summon us to be yet better versions of ourselves. Harold Bloom (b. 1930), Sterling Professor of the Humanities at Yale University, is one of the most influential literary critics of our time. He is the author of more than thirty books, including the New York Times best sellers The Western Canon, Shakespeare: The Invention of the Human and The Book of J as well as A Visionary Company, The Anxiety of Influence, and Possessed by Memory: The Inward Light of Criticism. He is a MacArthur Prize Fellow, a member of the Academy of Arts and Letters, and the recipient of many awards and honorary degrees. David Mikics is the Moores Distinguished Professor of English at the University of Houston. He is the editor of The Annotated Emerson and the author, most recently, of Bellow's People and Slow Reading in a Hurried Age. His reviews and articles have appeared in Tablet, the New Republic, and the New York Times.